Tottenham have confirmed they will play their Premier League match against Manchester United on January 13 at Wembley. Delays on the construction of Spurs' new White Hart Lane stadium meant there was some confusion over where the game against Jose Mourinho's side would be held. 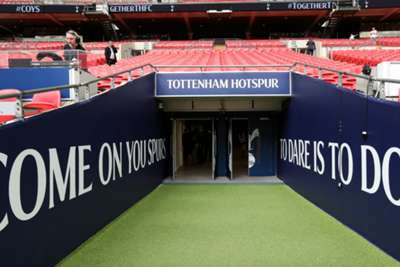 Spurs have had to play all their home matches at England's national stadium this season due to problems with finalising the critical safety systems at their new venue. The club insist that the work is progressing well and a testing phase will continue during the Christmas period, but the stadium will not be ready for the visit of United next month. Chairman Daniel Levy said via the club's website: "We are acutely conscious that we are asking fans to go to Wembley for far longer than any of us wanted to. However, we are now seeing the progress that we needed to see. "What I don't want to do is set any firm dates until we have finally achieved a safety certificate. So many people tell me to look at other major schemes that run late and, whilst I know it happens often, we are still hugely frustrated. "It is important, however, to recognise the sheer complexity of the scheme. It will be one of the first fully-integrated digital stadiums and will also be required to meet the latest and most stringent safety regulations. "Once again I want to apologise to fans and to thank you for your ongoing support. We have a busy time ahead both on and off the pitch, particularly after last night's [Tuesday's] amazing qualification for the last 16 of the Champions League. What a memorable night." Spurs expect the next update from the stadium contractors in the week beginning January 7.